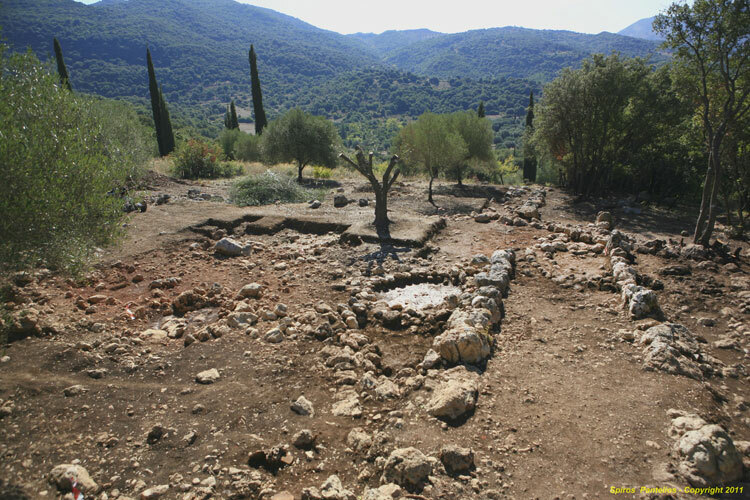 A new rescue excavation, directed by Dr Andonis Vasilakis, Director of the 35th Ephoreia has taken place in August to October 2011 at the location ‘Riza’ near the village Tzannata/Poros, in the island of Kefalonia (Fig. 1). The new excavation has revealed part of a LH settlement, connected with the well known royal tholos tomb at the location ‘Bourtzi’, excavated by Dr Lazaros Kolonas in 1992. An area of about 750 square meters was excavated and so far the following ruins have been discovered. In the east part of the field were discovered five Roman pit tile graves. Fig. 1. 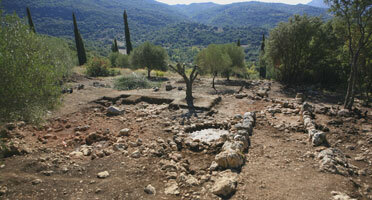 The Mycenaean settlement at Tzannata (Kefalonia) (October 2011). A monumental thick perivolos wall of difficultly identifiable function, built of large boulders, has been uncovered in a length of 50 square meters, aligned from North to South. To the west of this perivolos a parallel row of upstanding boulders borders a paved road parallel to them. Beneath the road an apsidal building of an earlier date has been revealed. The perivolos wall and the road are dated after the destruction of the small apsidal building around the end of LM III B or the beginning of LH IIIC. A third -probably the main- phase of occupation at the site consists of a large apsidal building, which has been partly revealed, in an extent of about 150 square meters. Its complete extent and height of preservation will be established in a next period of research. Built of large and medium size roughly dressed stones, this large building with a width of 1,80 m. is poorly preserved at its east part. The thickness of deposit varies, -following the slope of the field to the south- from 0,10 to about 1,00 m. The north part of the building is not yet completely excavated. The floor of the building constructed of beaten red mud containing small white stones, has been reached at its south part to the depth of 0,40 m. What seems to have been a clay dressed hearth was uncovered bellow the small apsidal building. Fig. 2. 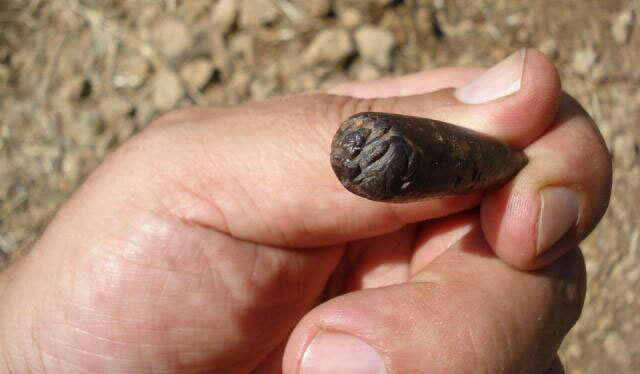 Seal stone or pendant in the shape of a drop. The pottery recovered in the undisturbed layers dates to the broad horizon of LH IIIB with many potsherds of an earlier date. Shapes which have been identified to date are: chalices of both short –the large majority- and high stems, cups with and without handles, skyphoi, jugs, etc. The study of the pottery has just started in the laboratory of the Ephoreia at Argostoli. Among other finds we report here a seal stone or pendant in the shape of a drop, with sealing surface difficultly identifiable to date and is still under examination and study. A number of clay loom weights and lithics from flints and chert stone were also collected (Fig. 2). An earlier phase has been recovered in the northwest part of the field. The discovery of this settlement well dated to LH III and probably earlier and a little later, in a close distance from the royal tholos tomb at Tzannata, opens a new chapter of prehistory in the Kefalonia island, where many LH chambers tombs are already known from excavations since early 20th century, but no settlements of the period has been excavated. The excavation of this new discovered settlement will be fruitful for the knowledge of the evolution of culture in this island, which lies on a key strategic spot, which controlled the gulf of Patras and the trade to the west. The island is also heavily marked in the Homeric epic, as the possible seat of the leader of a west Greek kingdom in the late Mycenaean period.